ALBANY, NY (WSKG) – Gov. 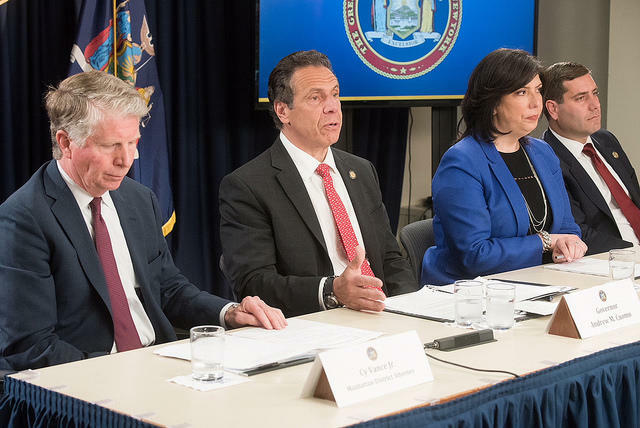 Andrew Cuomo announced Thursday that he’s appointed Nassau County District Attorney Madeline Singas as a special prosecutor to look into the domestic violence accusations against disgraced former Attorney General Eric Schneiderman. Singas, who formerly ran a special prosecutorial unit for women who are victims of violence, said she’ll leave “no stone unturned” in her investigation of the allegations against the former attorney general detailed in the New Yorker magazine, which include alleged hitting, slapping and choking of four women. “These allegations are extremely disturbing and very troubling,” Singas said. Schneiderman denied the allegations and said he was engaged in consensual role-playing with the women. He has hired a criminal defense attorney. The Nassau DA has set up a hotline for any other women who may have been victims. The number is (516) 287-3938. Singas said it’s too soon to draw any conclusions, but she said Schneiderman could potentially face charges of harassment, sexual assault, kidnapping, obstruction of breathing — and strangulation, which was criminalized through a law that, ironically, Schneiderman helped craft when he was a state senator. She said the state’s statute of limitations might mean, though, that it’s too late to prosecute some of the accusations. Manhattan District Attorney Cy Vance also was at the news conference, where he agreed to assist Singas in her investigation. It was an attempt to make peace between Vance and Cuomo after the two sparred over whether Vance should be conducting a probe into Schneiderman’s alleged conduct. Cuomo said there was a conflict in Vance leading the investigation because the state attorney general’s office was probing the Manhattan DA’s office over charges that Vance had not vigorously pursued past allegations against disgraced film mogul Harvey Weinstein. Vance, in a letter sent to Cuomo on Tuesday night, said the state probe into his office was political, and that Cuomo only started it because he was nervous about a Democratic primary challenge from actor Cynthia Nixon. Cuomo denies that and said his actions predated Nixon’s campaign. Vance did not back down from the charges he made in his letter, but he said he now “understands the governor’s decision” and agrees that the public needs to have confidence that there is no appearance of a conflict of interest. “Perhaps I was a little frustrated when the ground rules changed,” Vance said. Vance said that he already has issued subpoenas in the case, and he will be turning them over to Singas. Cuomo said if the charges are true, Schneiderman disgraced his office and that of other public servants, and he will pay for his crimes. Singas could not say whether any of the women in the New Yorker article have filed charges.